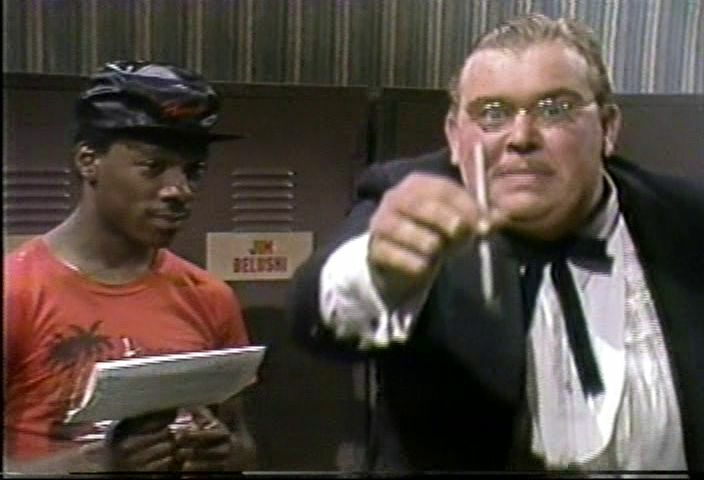 New cast member Jim Belushi's friend John Candy hasn't shown up yet; Joe Piscopo and Eddie Murphy map out a contingency plan while Mr. Mambo (John Candy) tries to lift Belushi's spirits. Good way to introduce Jim Belushi as the new guy on the show. I always take the host's appearance in a cold opening as a sign of confidence, and Candy's presence certainly gives this a boost. 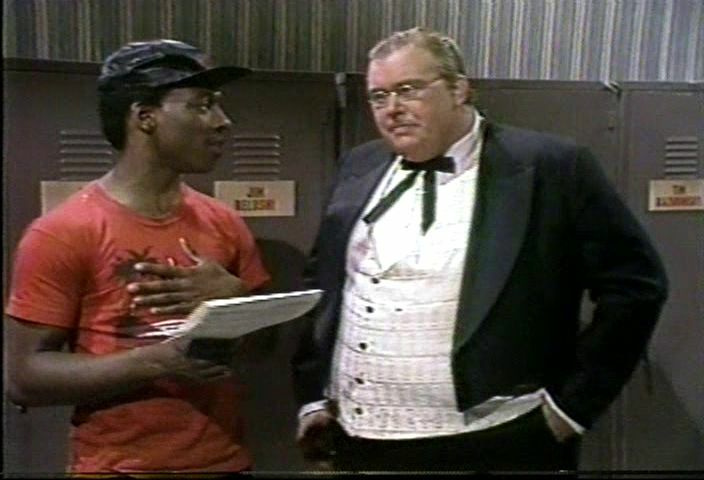 Eddie Murphy and Joe Piscopo's plan to do the monologue as Ed Norton and Ralph Kramden seems to be another acknowledgement of the two as the show's current "stars". 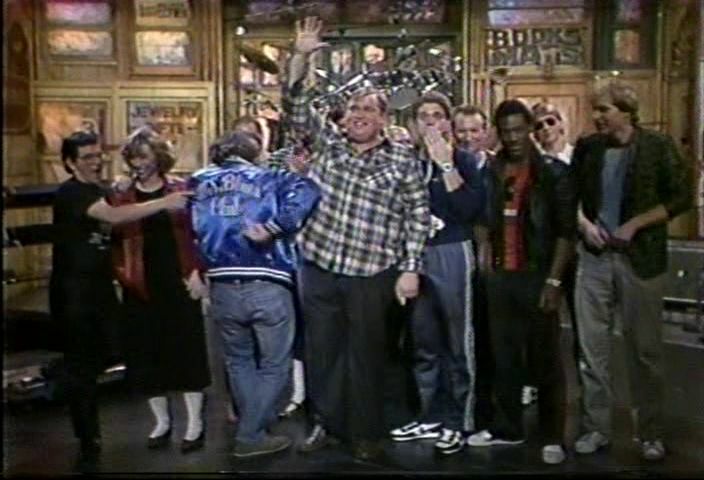 The side studio that Mr. Mambo and his entourage emerge from is Studio 8G; due to election coverage, SNL used this studio as a backup location the year before and the year after. This is now the current home of Late Night with Seth Meyers. Mr. Mambo was originally created by Nate Herman when Candy starred on the short-lived Big City Comedy, which also featured Tim Kazurinsky and Tino Insana, who appears in tonight's show and was a guest writer for the week. 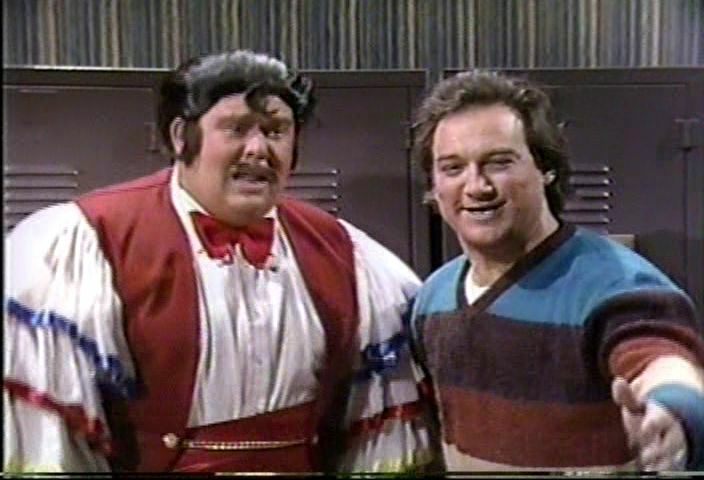 Instead of the regular opening theme, the SNL Band plays "Brazil"; Jim Belushi is added to the opening montage this week. 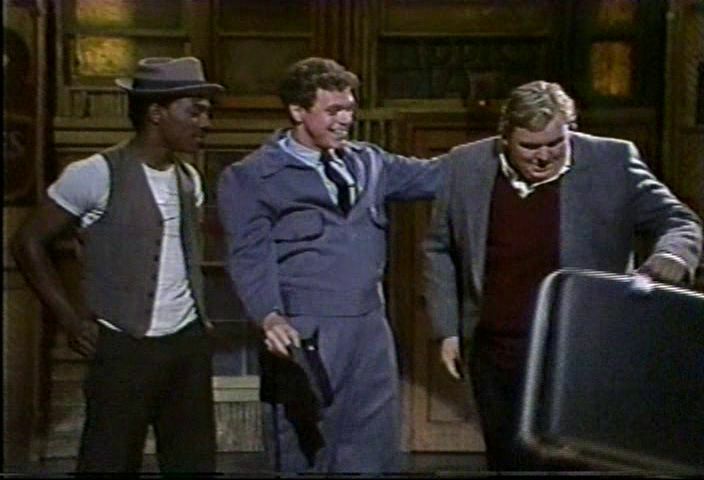 John Candy's late entrance interrupts Joe Piscopo and Eddie Murphy's Honeymooners schtick. Because he didn't have anything planned for his monologue, Candy heads to the next sketch. This is essentially an extension of the cold opening, serving as a way to have Candy "show up". Not really much to it, although I commend the interesting segue into the next sketch. The music that plays as Candy heads over to the other set is the same piece of production music used in 1989's "Robot Repair" sketch. Old country doctor Doc Edmund (Eddie Murphy) tends to an injured skier (Jim Belushi) and his pregnant wife (Mary Gross). This was a little overlong and didn't play as well as it could have; an off performance from Eddie Murphy as well. Nothing terrible, and there were still a few lines that I liked ("Better hurry and wash it up! Do you know where it's been?" after Gross's character gives birth), but it felt like a waste of Candy (who still made the most of his character), and an over use of the term "old fashioned". Robin Duke's nurse character Flossie seems like a variant of her Molly Earl character from SCTV; she gets a few laughs with her walk, and appears to make Eddie Murphy ad-lib "Mighty friendly today, Flossie!" and crack up by holding him closer than usual. Buckwheat (Eddie Murphy), Alfalfa (Mary Gross), Spanky (John Candy), Darla (Julia Louis-Dreyfus) and Froggy (Joe Piscopo) scare Miss Crabtree (Robin Duke) with their powers. A great way to bring back Buckwheat and the other Our Gang impressions, but this sketch belongs to Robin Duke, who does a great job playing Miss Crabtree at her breaking point. 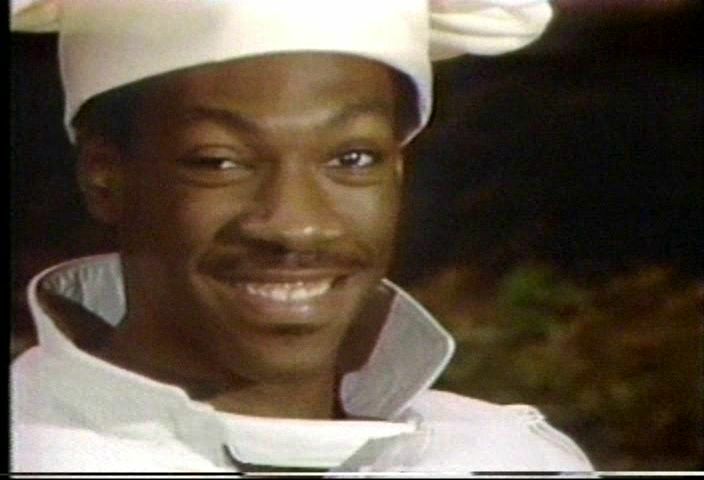 Eddie Murphy is wisely used as part of the group instead of being made the focal point of the sketch. Strong finish, too. The green-screen "flashing eyes" effect has a few hiccups; at one point, the cast's goggles don't flash but the effect can be seen in the shadows and highlights. Joe Piscopo shows footage of superstar Eddie Murphy living the suburban life in the Garden State. I found this weak; the whole "Eddie Murphy does typical suburban things while dressed in leather and surrounded by bodyguards" felt a little too obvious for my tastes. Piscopo's intro and narration is a little cringey (especially the "Eddie is such an urban guy"), especially since at the time Piscopo was known for being a little overeager in mentioning his friendship with Murphy. I'm sure the old man in the barbecue scene has been on the show before, at least in one of the earlier filmed bits. 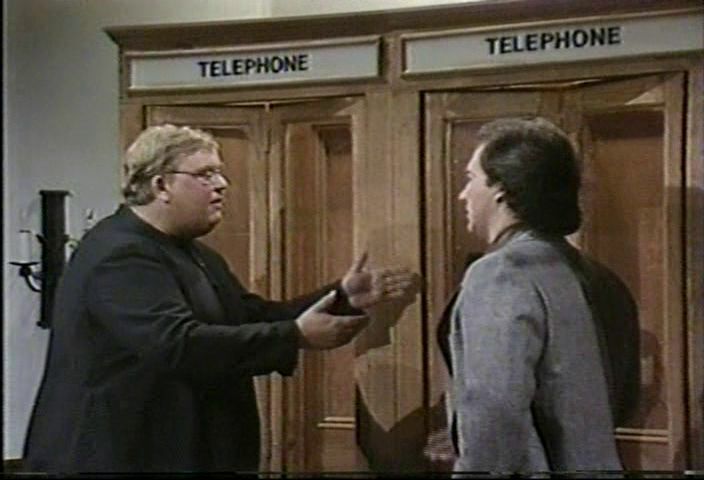 When the confessional is out of commission, a priest (John Candy) tries to hear Tom's (Jim Belushi) sins via adjacent phone booths. This was a simple idea executed well, with a lot of quick jokes coming from all the logistical issues that could arise from phone booth use (needing a dime, bad connections, etc). Candy and Belushi work well together here. Not many jokes this week, and the ones that were there were unusually weak. Joanna Holland Carson (Julia Louis-Dreyfus) discusses her divorce from Johnny. 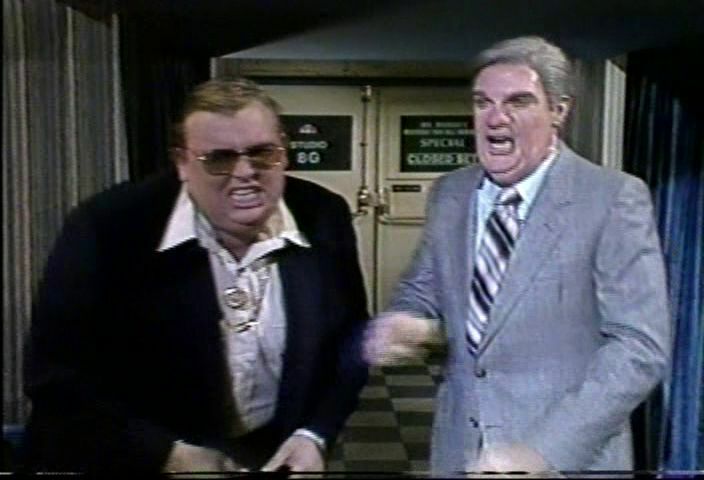 This has a easy lot of Tonight Show jokes: guest hosts filling in once a week in the bedroom (including Bill Cosby - that line has not aged well), Ed McMahon asking "how good was it? 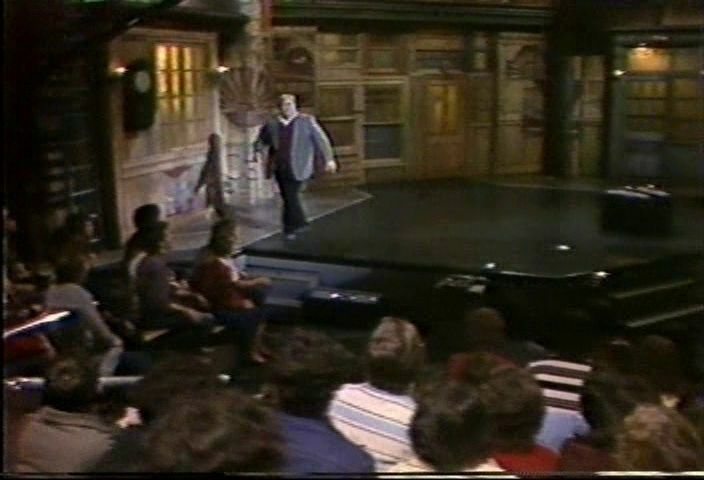 ", going to an hour from one-and-a-half; it picks up a little with Joanna declaring that the show is "not funny upside down either" and introducing an act that would make Johnny the legal father of all children conceived during Tonight Show broadcasts. 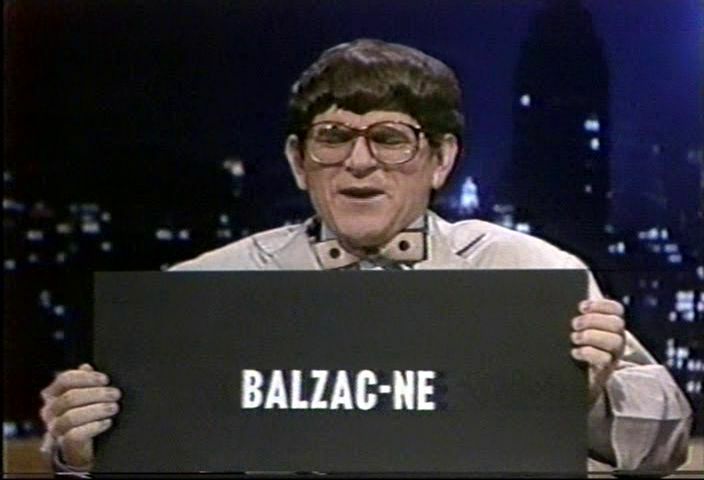 Dr. Jack Badofsky (Tim Kazurinsky) returns with a weaker than usual set of jokes about acne, although there is a fun fakeout with "Balzac-ne". The audience is into this one, though, which is more than I can say about the next two Dr. Jack appearances. In the dress rehearsal pictures on Getty Images, Brad Hall wears a bandage on his head for an as-yet-unknown reason. 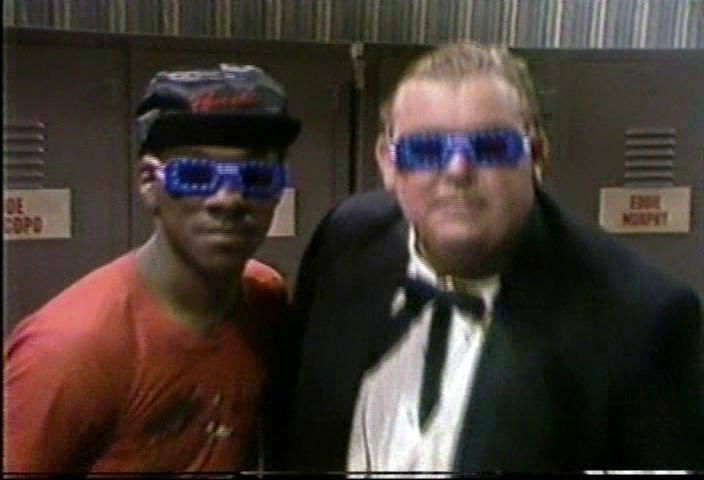 Dr. Tongue (John Candy) convinces Eddie Murphy to star in his latest 3D horror movie. 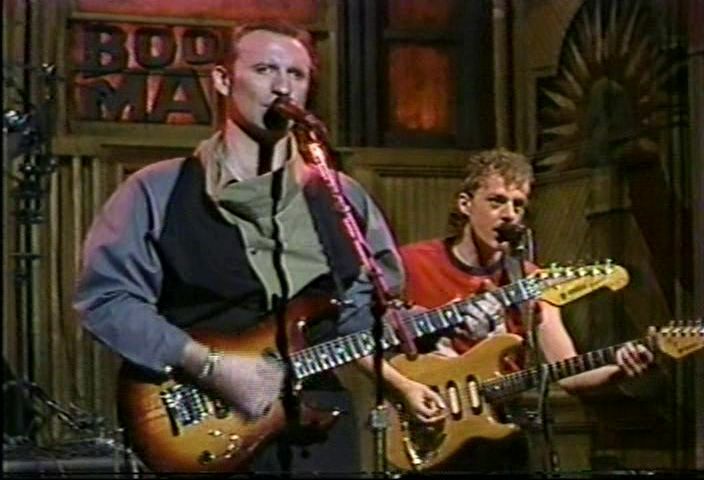 A quick bit used to introduce the musical guest; I won't rate it, but it's always fun seeing the "3D" joke from SCTV (moving back and forth from the camera, accompanied by a music sting). 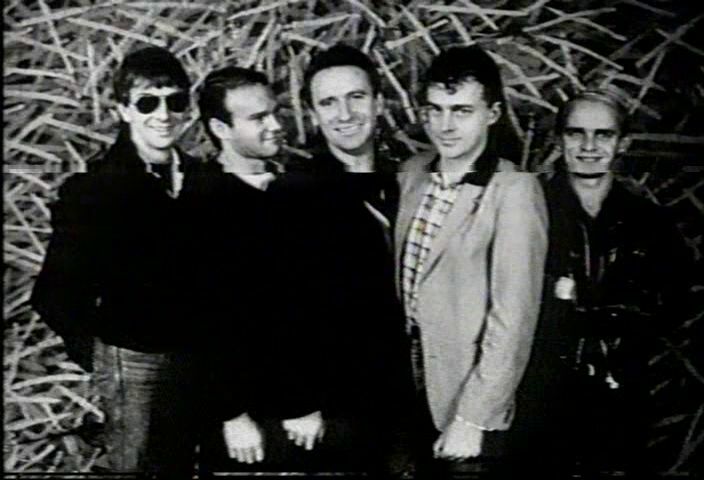 MUSICAL PERFORMANCE: "DR. HECKYLL AND MR. JIVE"
Off the Cargo album, this single was released in Australia a full year before this appearance (it was currently on the US Billboard charts at the time). 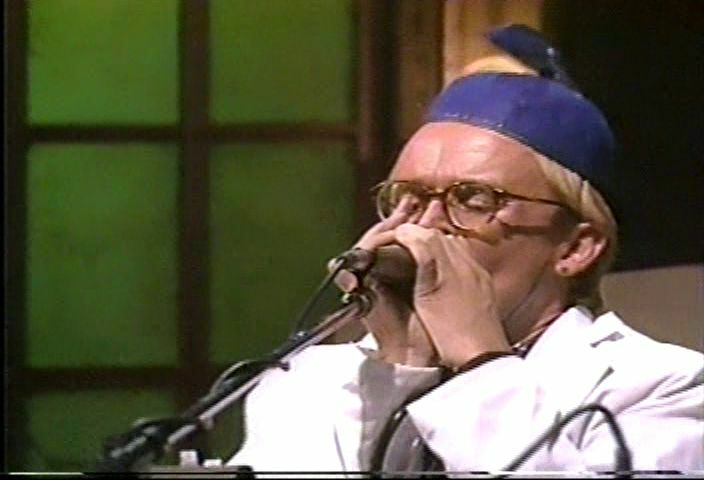 A fun performance: the late Greg Ham wears a lab coat, glasses, propeller beanie and buck teeth, evidently in character as the song's protagonist. It appears that the master copy of this episode had been damaged sometime before 1999: when the Comedy Network aired this show, there's a noticeable audio-visual wobble during the chorus late in the performance; the same glitch shows up in the 2004 NBC All Night airing. Behind the scenes, the McDonalds mascot (Joe Piscopo) is a nasty egomaniac. 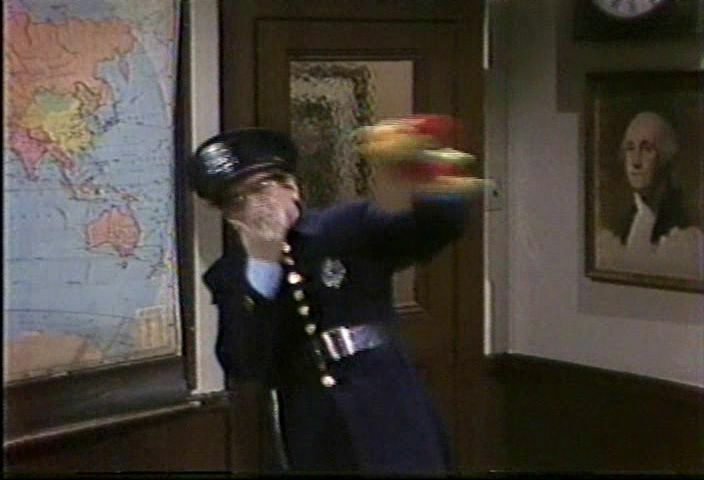 Piscopo carries this sketch, but the perpetually underused Gary Kroeger (in his first sketch tonight) does well as the new employee witnessing Ronald's dark side for the first time: watch him as Piscopo first treats him as if he were a little kid. Some fun McDonalds-related gags (Ronald's booze is his "secret sauce", him telling an overworked writer "You don't deserve a break today! "), although the joke about Ronald's interest in finding out there are some kids waiting outside is a little too dark. 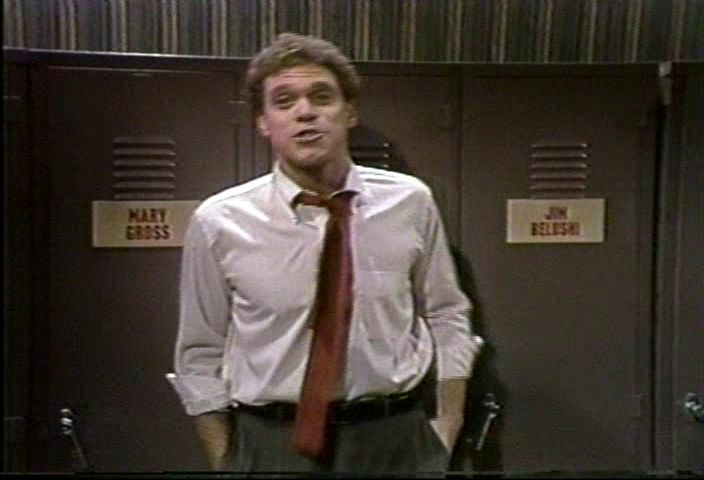 Nice underplayed joke at the end: Piscopo takes the script with him into the bathroom after learning there's no toilet paper. 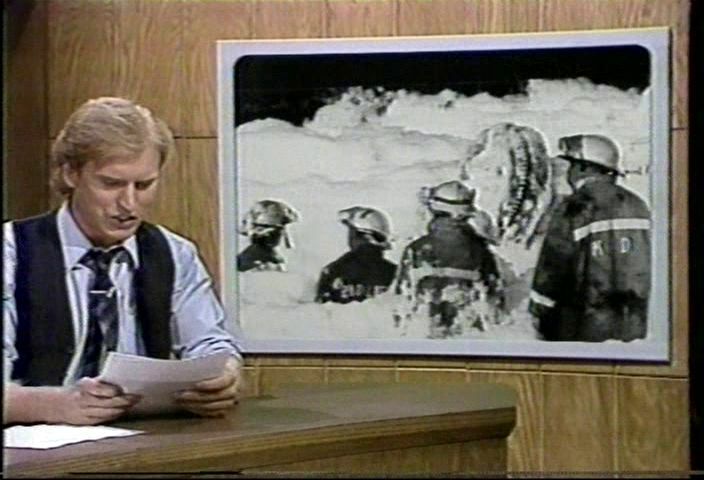 The original West Coast broadcast is interrupted mid-sketch with a bulletin about the Beirut barracks bombing. 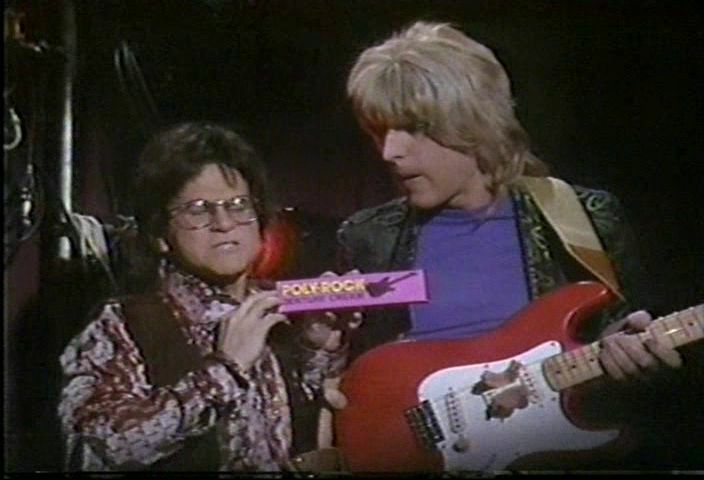 The adhesive to use when you no longer have your own teeth to play guitar solos with. Not really much to it; maybe it's because the aging rocker trope is now so commonplace, but I thought this was merely OK.
Brad Hall's "solo" at the beginning was the ending to "Are You Hung Up?" by Frank Zappa and the Mothers of Invention; I can't place the second solo. Interesting that this comes a week after Eddy Grant played a guitar solo with his teeth on the show. 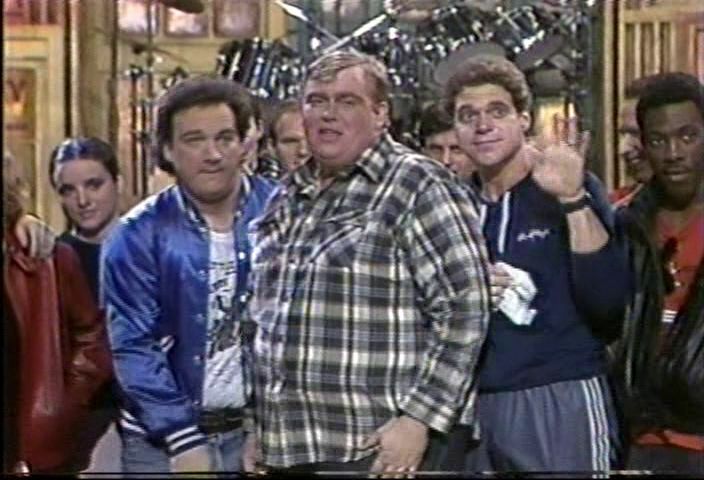 A groom-to-be (Jim Belushi) reluctantly comes to Candace's (John Candy) Fantasy Shack for one last whirl before tying the knot. A little underwritten, but good performances from Belushi, Candy and Tim Kazurinsky. I like how absurd the "millionth customer" ending was in this setting, with Belushi getting TV coverage and a phoned congratulations from the President. 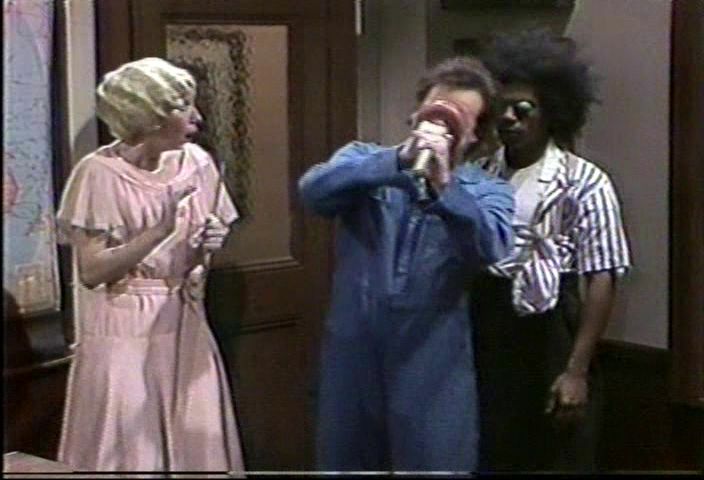 This seems to be the show's annual "have the female performers play prostitutes" sketch: Julia Louis-Dreyfus plays a lisping Princess Leia, Robin Duke plays "Annie Oakley" with an odd accent, and Mary Gross plays a leggy Dorothy from The Wizard Of Oz (complete with stuffed dog as Toto). 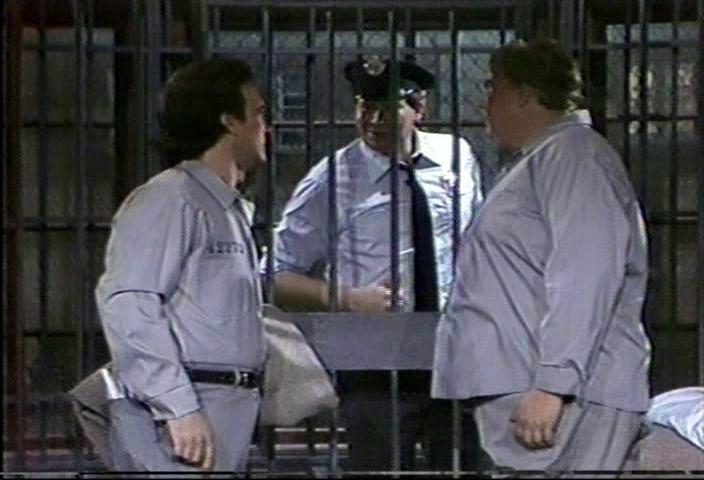 Knuckles (John Candy) and Fingers (Jim Belushi) look forward to their incarceration for the winter. The audience is mostly quiet for this one, but I liked this; it feels very much like it could have originated on the Second City stage. Once again, Candy and Belushi work well together as the two criminals who act more like a vacationing couple. 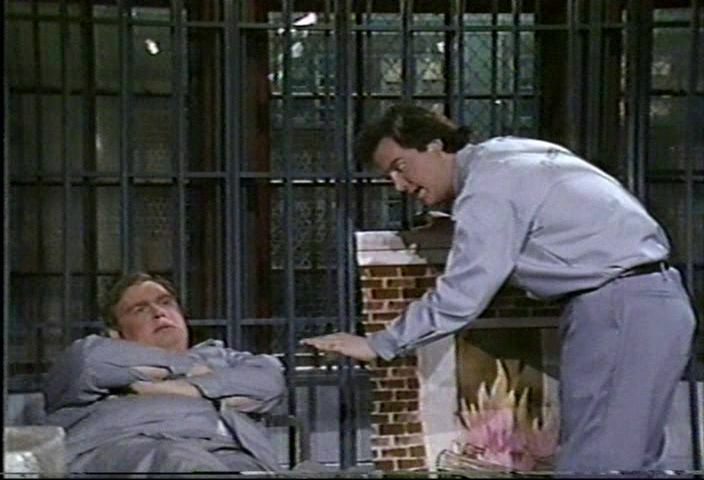 Tino Insana appears in this sketch as guard Bull Murdock: Candy and Insana were in the Second City Chicago main stage cast together a decade before (with Bill Murray and next show's host Betty Thomas, among others), and as mentioned earlier, worked together on the short-lived Big City Comedy. I can't place the voices of the two effeminate off-camera prisoners who got the characters' old cell. 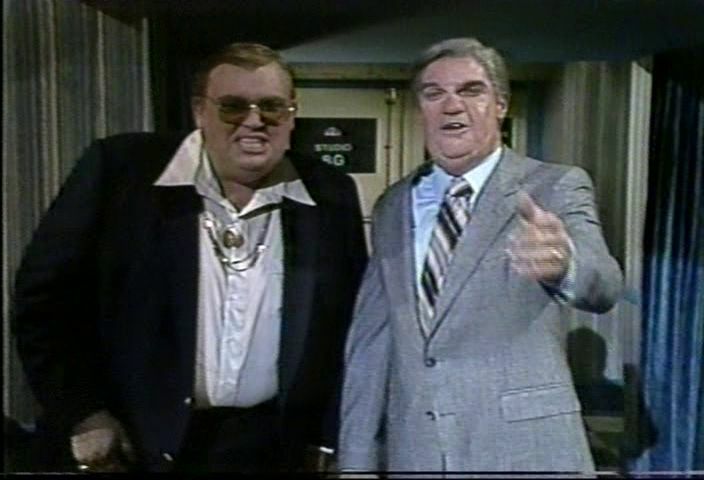 Leaving Mr. Mambo's special in Studio 8G, second bananas Ed McMahon (Joe Piscopo) and William B. Williams (John Candy) compliment each other's work and introduce Men At Work's second number. Again, not rateable, but it's interesting that they've kept the Mr. Mambo special as a background thing a few times this episode, and I like how they changed up the musical guest intros this week to work in Candy's characters. Piscopo's wearing a huge amount of prosthetics to play McMahon again. One Candy character that didn't make it into the final show was Johnny LaRue; evidently he did appear in dress rehearsal, though. 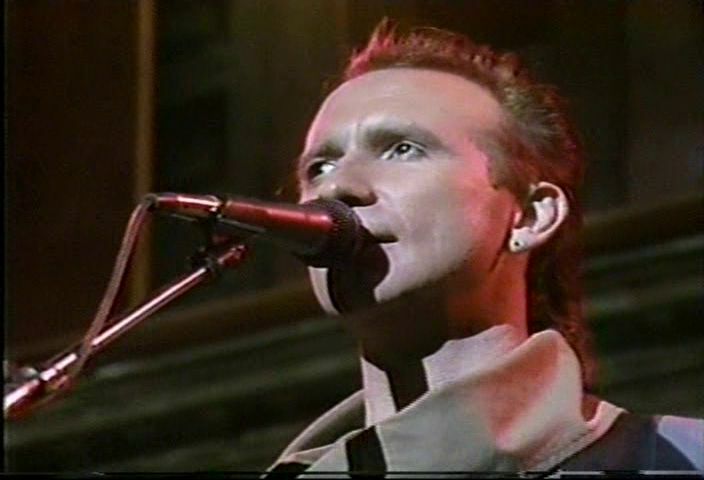 MUSICAL PERFORMANCE: "IT'S A MISTAKE"
Another single from Cargo; a more somber song for the band. Ron Strykert plays the distinctive riff during the chorus and gets a solo late in the song. 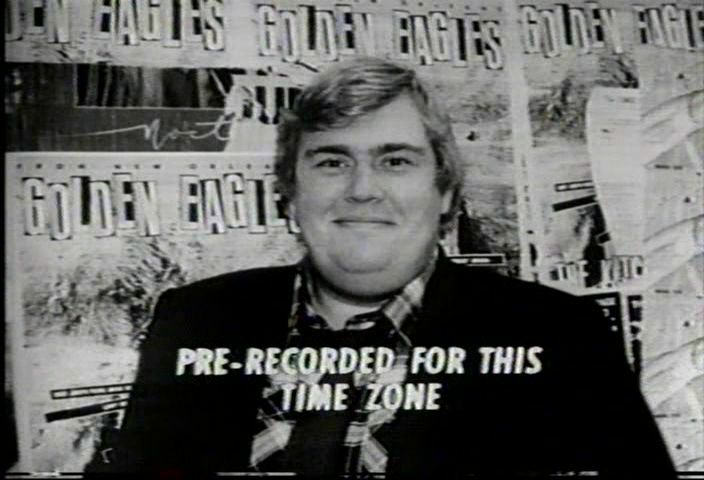 John Candy gives special thanks to True West for letting Jim Belushi out to do the show tonight. The goodnights cut off before the credits roll on the original airing, but are intact in the CN/NBC All Night airings. 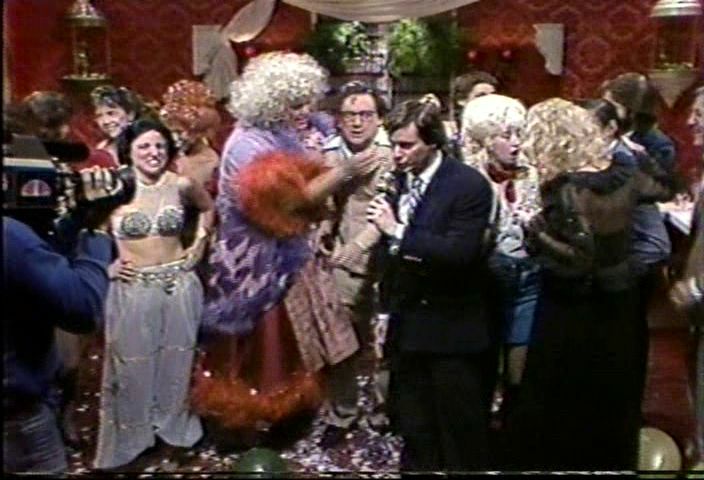 Tino Insana is credited with the SNL writers, while SCTV writer Michael (brother of Martin) Short gets a "special thanks" credit at the end of the scroll. A decent outing: while it may not be an all-time classic, and actually a tiny bit disappointing considering who the host is, this week's show felt more stable and thoroughly consistent than the previous few shows. 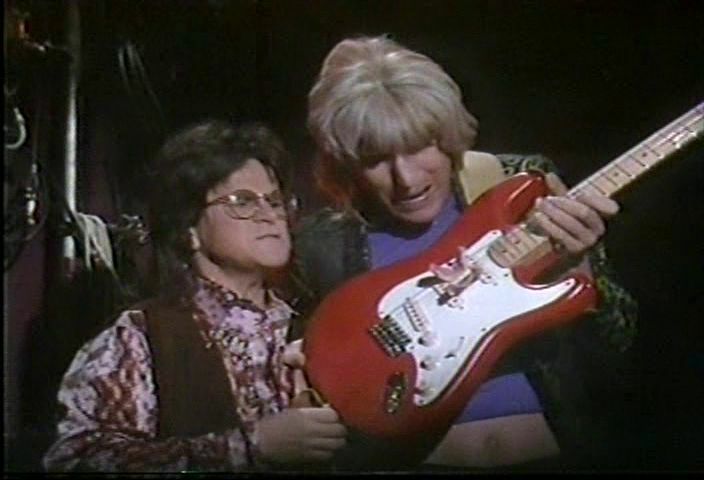 Candy was solid, carrying a lot of the show without necessarily taking away from the cast; it's disappointing that this would turn out to be his only time hosting the show (a planned co-hosting gig with Eugene Levy a year and a half later was cancelled due to the writer's strike). Jim Belushi also has a strong start to his two-season tenure with the show, appearing as prominently as Joe Piscopo and Murphy tonight.